Ok, you’ve got the money. These are incredibly cool and beautiful. But what could you do with a hard-driven car without a speedometer, heater, insulation, bumpers, or soundproofing in Manhattan? Get real!” That was rational me, talking to myself in 1967. Tucked under a ramp at Garage Mon Repos in Lausanne, Switzerland, were two several-year-old Ferrari 250GTO coupes, either one $3500 — my choice. I passed, dismissing owning one as preposterous. Twenty-odd years later, the better-looking but harder-used of the pair brought more than $15 million from a Japanese collector. Some years after, I told that story at dinner on the Riviera. The man across from me, Jean Guichet, said, “You can’t imagine how happy I am to hear that. That was my car, and my wife made me sell it — for $4500! — if I wanted to buy another racing car.” Guichet had a lot of success with GTOs, including finishing second overall at Le Mans in one of his two personal examples, and he did quite well racing three others, but he took particular pleasure learning that the man who bought a GTO from him for “almost nothing” sold it for even less. I love the idea of Ferraris and have thoroughly enjoyed driving a few over the years, but the only model I’ve ever really wanted was the GTO. I surely missed the absolute bottom of the market forty-four years ago, when a GTO was just a clapped-out, no-longer-competitive racing car. At that time, there was no such thing as vintage racing, and the investment/collection frenzy hadn’t begun. FIA rules for racing cars mandated that 100 examples be built, but only thirty-six (or thirty-three? Or thirty-nine? In any case, not 100) of Giotto Bizzarrini’s 3.0-liter, V-12 hot rod were ever produced. Never mind Enzo Ferrari’s deception, as I’m pretty sure there are more than 100 250GTOs around today; it’s a pretty easy car to counterfeit. True, you can’t fake provenance, at least not very easily, but the car itself is really quite simple: a tube frame, a supertuned engine pushed back and down in the chassis, and a live rear axle. Obviously, racing history is important, but I think the GTO’s real attraction lies in the fact that this may be the best-looking Ferrari “road car” ever. It still has some of the raw, rugged look of the earliest closed Ferrari GTs, leavened with exquisite feminine forms that Italian designers mastered long before others even tried to combine function and beauty. Sergio Scaglietti’s fine hand and eye shaped the GTO with plenty of Pinin Farina influence, and in the long-nose, pulled-in-corners aerodynamics, there’s even a bit of Bertone’s Franco Scaglione in the design, not to mention strong Jaguar E-type overtones. GTOs are powerfully attractive, and the list of its various owners and drivers gives you a history of racing and collecting of the last fifty years…and the next fifty. 1. The composition of the nose is very similar to Jaguar XK-D and XK-E shapes but is more fluid and more beautiful. 2. Notice that the windshield is fairly upright, assuring better visibility in the rain and at night than more severely sloped glass. 3. Simple sliding transparencies provide ventilation and are the lightest possible solution. 4. Note how the “hip” bulges upward immediately behind the door, with no soft surface transitions. 5. The much-copied GTO side slashes ventilate the “engine room,” where a 250 Testa Rossa racing V-12 generated a great deal of heat as well as great power. 6. Wire wheels may be heavier and harder to keep truly round than cast or forged aluminum units, but they are truly jewelry for the unadorned bodywork. 7. Mickey Thompson hadn’t invented low-section-height tires back when GTOs were introduced, so along with greater tread width to get the power down come impressive tall sidewalls. 8. All the minor lamps are standard parts-store items–cheap, light, and easily replaceable. 9. Organic brake-cooling inlets are nicely radiused at their periphery. 10. The tiny radiator opening owes a great deal more to Jaguar designer Malcolm Sayer than to Italian tradition. Compare this to the typical Ferrari sports racers with big openings. 11. There is nothing more elegant than a Nardi wood-rimmed steering wheel. 12. Ergonomists may not like them because they’re hard to distinguish at night, but rows of toggle switches are visually wonderful. 13. 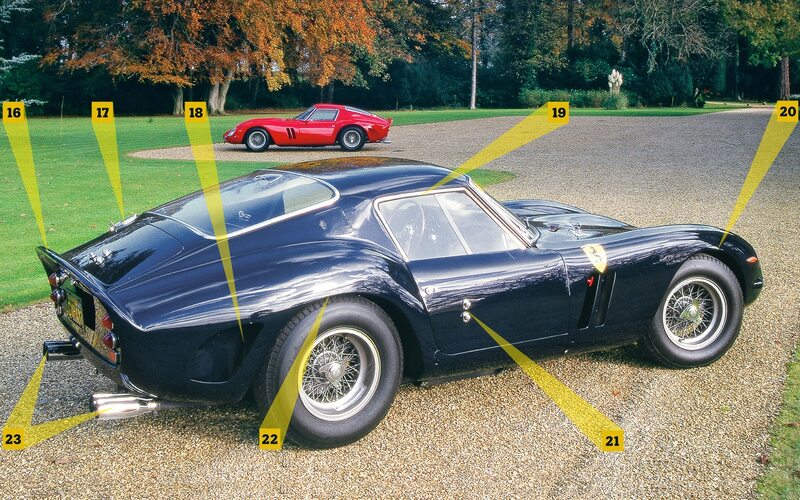 Now an iconic feature of Ferrari road cars, the metal shift gate was initiated on the GTO. 14. 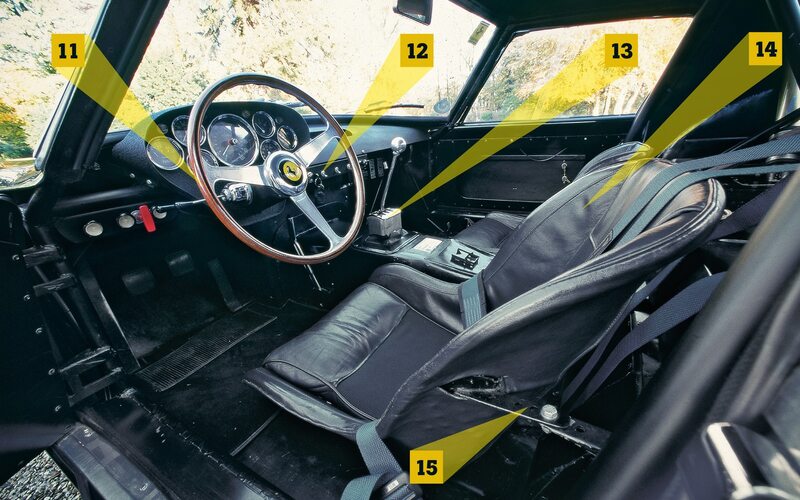 Bucket seats are extremely simple in form and extremely comfortable in racing action. 15. This primitive framework is a wonderfully straightforward, almost brutal, solution to fixing the seat securely in the chassis. There’s nothing illusory here; this is a racing car. 16. Richie Ginther introduced to the racing world the duck-bill spoiler he noted on Larry Frazer’s radial-engine special in California. 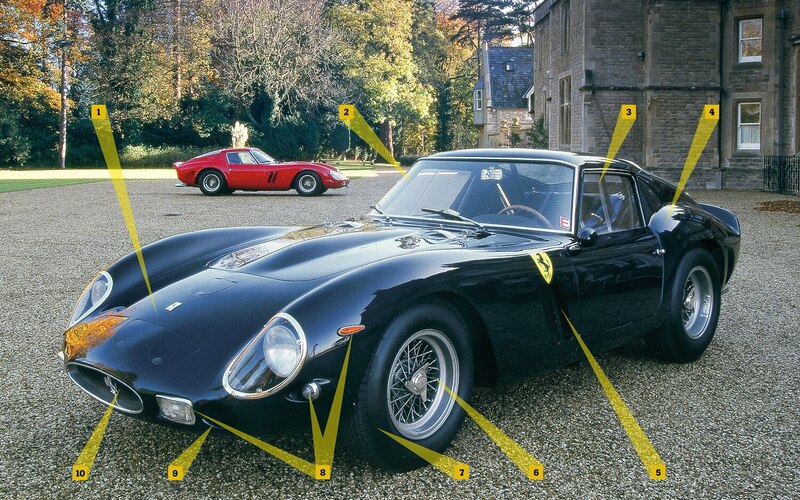 Ferrari was the first to generalize the idea. 17. Ah, the wonderful racing fuel cap that captivated stylists the world around. Here it is completely functional as well as highly decorative. 18. This indented scoop relieves pressure inside the rear wheel well and evacuates brake heat. 19. This edge should be perfectly straight for function, but Italian workmen will always add a millimeter or two of crown, resulting in this graceful curve that still cradles the sliding glass. Notice that the door itself is just a flat-wrapped sheet, no compound-curve forming. 20. A typical practice in period, the front wheel opening is nicely round, not flattened on top as in the rear. 21. Recognition lights for night racing helped pit crews and scorers distinguish a specific car. 22. Observe that the rear wheel opening is vaguely rectangular, a habitual practice in the late 1950s and early ’60s, now seen as anachronistic. 23. Two tailpipes for each bank of cylinders is impressive, probably intimidating to competitors. Which is to say that it’s a pleasant small hatchback in disguise.